Wholly designed in-house at the Shama Yachts yard, the new 116 Super Sport stands out right away for the innovative and aggressive lines on which the entire stylistic project is based. propulsion by Twin Disc Water Jets TDJ 220. 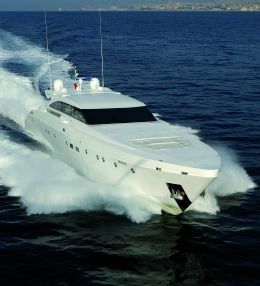 For further information contact Shama International Yacht Sales Limited; tel. 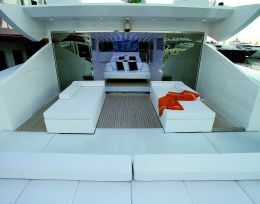 +44 7793581550; +44 1246 472634; email info@siysl.net - info@shamayachts.com; website www.siysl.net - www.shamayachts.com. The Shama 116 Super Sport is a modern, very refined yacht for which the internal Shama design team had the latest design technology at their disposal. Thanks to sophisticated CAD software the Shama team could predict even the smallest details with extreme precision, a fact that also facilitates dialogue between designer and technical department. 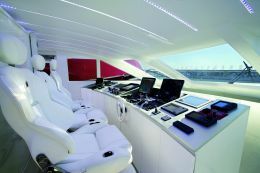 Moreover as a result of these technologies the yard, in tandem with the future owner, could decide on the layout of the interiors to ensure the creation of a yacht that corresponded perfectly to the latter's desires. Comfort and seaworthiness are the two basic elements upstream of any Shama design, which is why the yard has developed very severe design and construction checking procedures to which every yacht is subjected before launch is announced. Management experience together with Shama's considerable company structures lie at the heart of a very careful production process which has resulted in vessels that stand out in the increasingly vast range of large yachts. 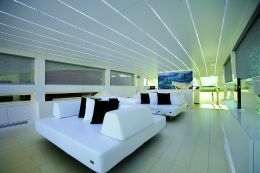 The yard specialises in 100' plus yachts in fibreglass. The current range has three very different models which share construction material and size, and of course the qualities inherent to every Shama creation. With its 10.000 square metres of production premises Shama is the biggest private specialised yacht building yard in Egypt today. Among the boats offered by this Egyptian yard we've chosen the 116 Super Sport. 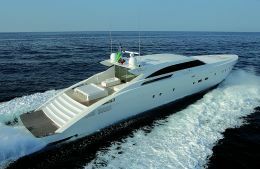 As we said earlier, she's a very modern yacht, designed on a two deck plan in harmony with current trends to offer superyachts that are developed on the Open concept. The problem for designers in this case is to suggest something original and at the same time lasting. We feel that with the 116 Super Sport Shama has achieved this objective. As we said earlier, the interiors are made to measure for each individual owner. On the model we saw there were minimalist choices, though never excessive, so that each environment is bright and welcoming thanks to extensive windows in the superstructure and the ship's sides. One of the unusual choices we noted in the layout of this 116 - the dining area on the lower deck - leaves the whole main deck for the saloon where there are two large sofas of the same regular shape in a central position, one facing the large glazed area aft and the other a big plasma screen which contributes to an imaginary separation from the bridge. We also liked the choice of leaving the bridge open towards the stern, with only the screen housing furniture separating the two environments. 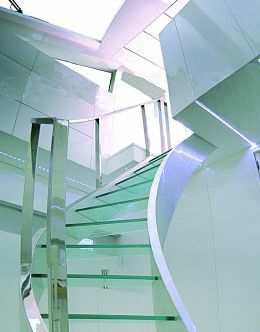 The whole is developed over a very spacious area and the furnishings are prevalently white, which contributes to the perception of largeness and luminosity. The bridge too is included in this logic: the three ergonomic and electronically fully adjustable seats are white, as are the facing panels and the furniture. The glazed superstructure aft consists of four panels of which the two central ones retract to form a single environment with the cockpit where there are two sofas set longwise, in the part sheltered above by the extension of the superstructure, and a spacious sundeck aft. Another effective choice made by the yard in creating this yacht is the great single stairway set in the countermould of the stern, linking the bathing platform with the cockpit. 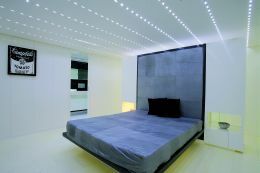 Large and safe, it gives further personality to the design. 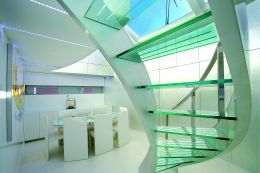 As for the lower deck, the dining room is in the area forward, on the port side, while the galley is developed along the starboard side and separated from the surrounding areas by a stairway with a strictly white structure and glass steps. The owner's full-beam suite is amidships and includes a centrally positioned double bed, a large bathroom with separate WC, a shower unit and a wash-basin room. Here too the designers' choice was based on the contrast of black and white, as in the other cabins, especially with regard to the bathroom finishes. From the dining area a central corridor leads forward to another two facing cabins, both with double bed, private bathroom and wardrobe. The same corridor, again forward, gives access to a large area with three bunks and two bathrooms. The crew's quarters are in the area aft of the owner's suite, with independent access, galley, mess and two cabins, each with bathroom. From this zone there is direct access to the great technical room in the stern area of the hull. Going back to the main deck we observe that special attention has been paid to open air life, both for sun lovers - plenty of cushions both forward and aft - and for those who prefer to relax in the shade. The whole has been created with great attention to detail which results in an aesthetic coherency throughout and contributes personality and elegance to this Shama yacht. Considering the size, the performances too are noteworthy. 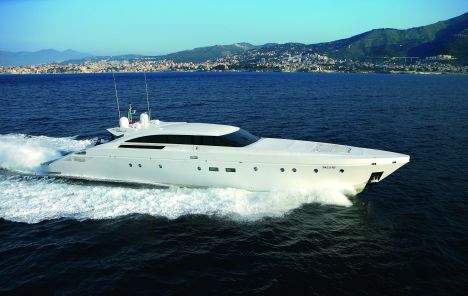 In spite of her 100 t. displacement the 116 Super Sport has a maximum speed of 36 knots and a cruising speed of 32. Of course for that kind of performance you need lots of power and the right propulsion systems. So the engine room houses either three 1.830 HP Caterpillars or three 2.000 HP MTUs coupled with Twin Disc Water Jets TDJ 220 transmission.